As one of the last of the Ten Pound Poms who left England in the 70s, I’ve finally come a little closer to understanding the nature of fire and its place in the Australian bush. The love-hate relationship we have with fire as both friend and foe – as both working partner and surly antagonist – was never more evident than when we first arrived in Tasmania. 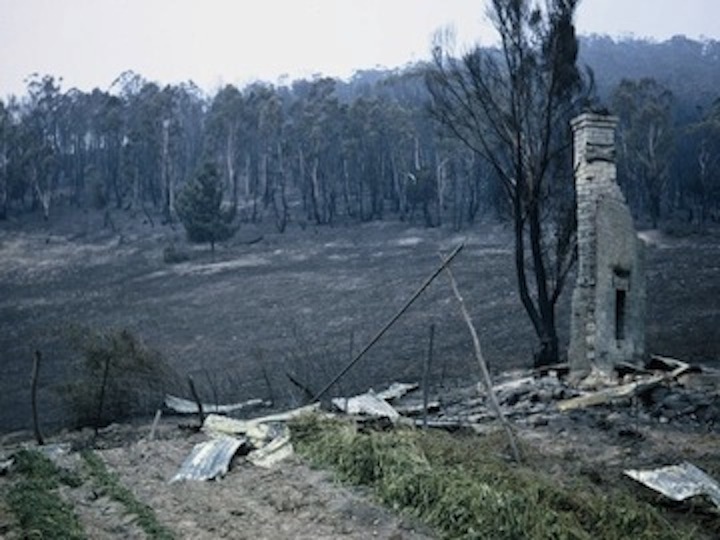 At that stage, the Black Tuesday bush fires of 1967 – that killed 62 people, injured 900 others and left 7,000 homeless – was still fresh in every Tasmanian’s memory. On Tuesday 7 February 1967, bushfires raged throughout the Hobart region – fanning both sides of the River Derwent. 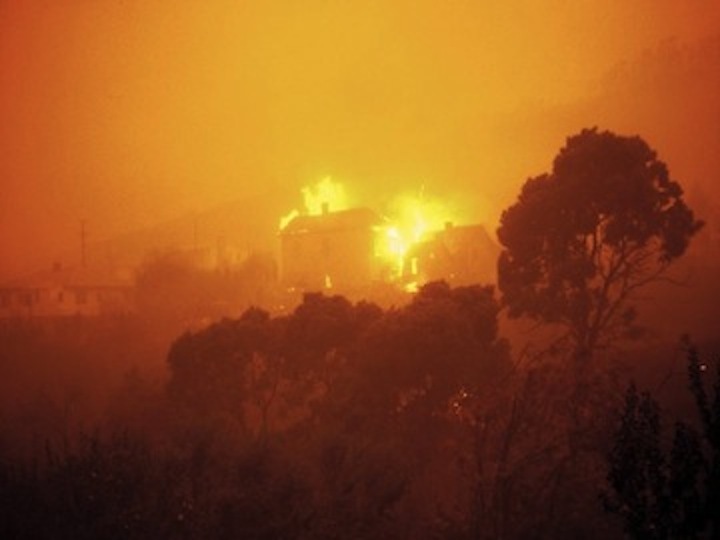 The ‘Black Tuesday’ fires were driven by 110-kilometre winds and 39-degree temperatures; not only claiming human lives but also killing thousands of animals and livestock. Retired firefighter Bill Burke remembers fighting the fires during that hot and windy week in February 1967. These photographs are never before released images of the devastation in Hobart after the bushfires (photos courtesy of the Tasmania Fire Service and the Woolford family). Country drives during those early years provided a rich source of inspiration for my first ceramic pieces – fueled by the aftermath of those ’67 fires. Green paddocks could be found that sported lone chimneys standing in desolate isolation, often surrounded by the remains of a cottage garden once lovingly tended. These images influenced my early designs. 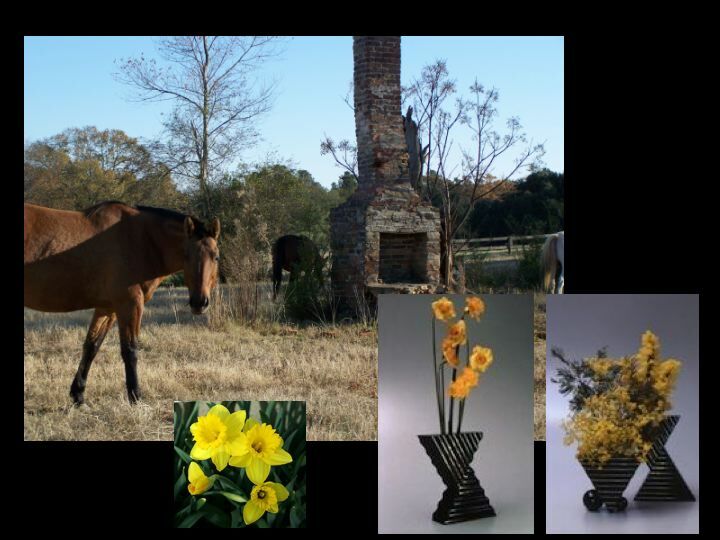 From fire to fire – the ceramic vases of slip cast stoneware that I created at this time were intended to celebrate spring – of new life emerging from the ashes of devastation. (Fire in service as a control burn – Mount Nelson. Porcelain works I produced whilst an artist-in-residence at the Arabia studio, Helsinki, Finland – inspired by the flames of passion!!). The transformative nature of fire is obvious. From the destructive to the productive. From the moment mankind first mastered the art of fire to harness it to cook his food, we became civilized. 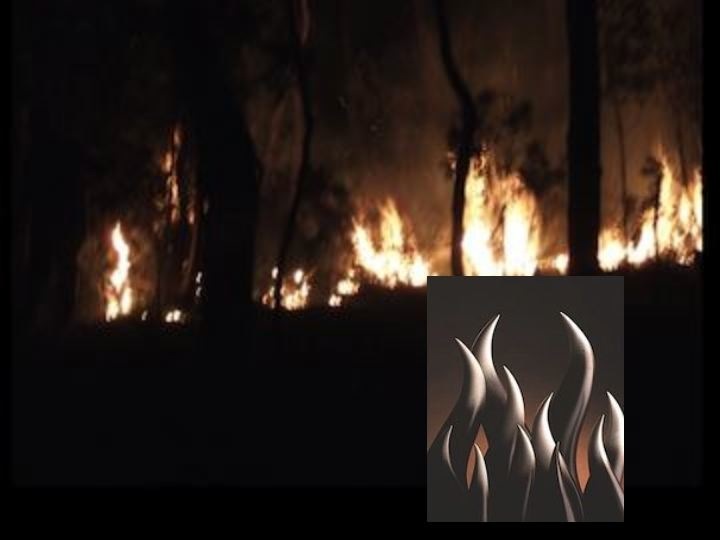 So vital has fire been to the development of mankind, that fire ecology has been linked directly with human ecology – fire was to change the raw into the cooked, the poisonous to the palatable and marked humanity’s transition from nature to culture. Richard Wrangham in his book Catching Fire believes that ‘one of the great transitions for humanity in the history of life stemmed from the control of fire and the advent of cooked meals’. 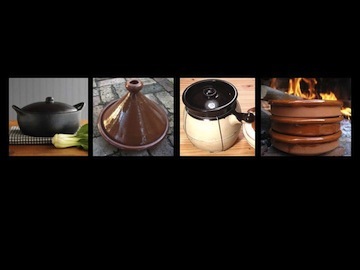 According to food historian Felipe Fernández-Armesto, author of Near a Thousand Tables: A History of Food the main legacy of fire-cooked foods to society is not just physiological (as is claimed by Wrangham) but fire also has profound social effects. Eating around an open hearth, or the campfire becomes a place of communion and community. So when we partner with fire in the pursuit of eating – alchemical and social magic occurs. 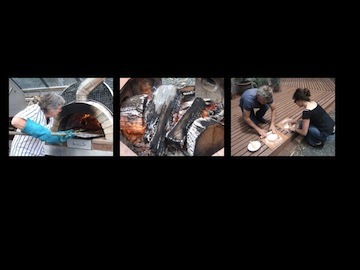 Family and friends – food foraging, fire, and cooking with clay – Brunyfire is dedicated to these experiments. It is here, at the Observatory on Bruny, that my precious collection of traditional clay cooking pots reside – and grow in number. Cooking on the open hearth has inspired the sourcing and obsessed possession of these pieces. They reflect the places we have visited, most often collected first hand from their country of origin. In these humble vessels lie the rich narratives that recount hidden stories of the human experience. Within their brittle walls – the patina of memory is soaked into their absorbent carcasses – of making do, invention, inspiration – of foraging, cultivation and civilization. Catching Fire: How Cooking made us human Richard Wrangham, Profile Books Ltd., 2009.